I have always had a very special spot in my heart for fruits and vegetables. All types of fruits and vegetables. I always loved farms, farmers, farmers’ markets and all things farming, growing, earth, fresh produce and all things related to that! It is no wonder, coming from a family whose main business happens to be in farming and growing. In producing food. I have grown in an environment where earth is valuable, as precious as a family member. Earth, weather and the environment were regular topics on our dinner table. Be it when Dad would talk about how a frost storm burnt the top of the trees, how lack of rain produced dryer oranges one year and how too much sun dropped many fruits pre-maturely on another occasion. I have many times heard how rain is best for the colour and flavour of blood oranges, and how irrigation has to be natural and minimally assisted only when necessary. I have run in endless stretches under thousands of trees hidden under their shade from the sun and on their higher branches from everyone else! With the birds, picking fruits, munching myself full unable to find an empty millimeter to fit lunch! Always told to not snack an hour before lunch at least, never able to keep myself from doing just the opposite! Until today I am soft in the heart for fruits and vegetables, for farms, farmers markets, growing, fresh produce, the smell of earth after the rain and most of my dreams take place under trees in their shades or over their branches, munching on fruit accompanied with birds! To date, one of the first things I look for when traveling are the local farmers markets. There is no better introduction to a city/area and its local food and produce than in its farmers markets. It is like a live presentation that brings you up to speed with the place’s foods, people, culture and most their thinking. After that, you are pretty much informed and free to pick the activities and events that are your preference. I had the pleasure of visiting some of the world’s most gorgeous farmers markets. I had been to many a great places that offered absolutely Divine produce. I had met many farmers along the years in perhaps every corner of this globe and I had never once felt that any one of them was boring, uninformative, repetitive or not worthy! Every time, I learnt something new! Every time I tasted something totally new to me! Every time I met new amazing people… It is really the one activity that I first recommend anyone to do wherever they plan to go. Keeping in spirit with earth and its gorgeous produce, in spirit with fruit, and in spirit with childhood favourite snacks and munching options… I chose to share with you the recipe for fruit leathers today, or perhaps you know them as “Fruit Roll Ups”. Because as I was going through my ‘Culinary USA’ trip pictures, I found a bunch that I took at the San Francisco Farmers Market and some from Napa Valley (images above) and remembered how my daughter kept telling me: “Mum, these are so good! We should make fruit roll ups with them” (every time she picked fruits and bit on them). The fruits were so good and beautiful, both of us completely filled up on them almost everyday! 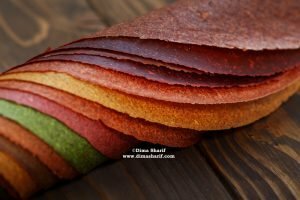 All that reminded me of the fruit leathers and I thought they are a brilliant recipe to share here, because they are the easiest thing to make, and also perhaps the most delicious snack to enjoy. These leathers are also very healthy, packed with nutrients and make amazing lunch box snacks for your kids. they are much better for them to munch on in the afternoon instead of sodas, crisps and other sweets. You will love munching on them too. This recipe is pure, there is no addition of anything that could cause any irritation. I do not use the starch that other people do for texture, nor do I add any sugar. I do add honey, but simply because honey is super healthy and nutritious too. It works well with the fruits as well. No preservatives, chemicals… nothing at all, just the organic fruits and the raw honey! This recipe is for a snack that is Gluten Free, Cane Sugar Free, Lactose Free, Fat Free, Vegan and packed with vitamins. In making this recipe you can use any fruit you like. For instance use any berry type you like (strawberries, blueberries, blackberries, mulberries…). You can use peaches, apricots, plums, or figs (skinned). You can use apple puree, banana puree, even avocado puree! Grapes work very well here in all varieties, and so do papayas, guavas (strained to remove the seeds). Make these fruit leathers, then cut them in strips with the baking paper, then roll and tie with a ribbon. Place these in an airtight container for your kids to pick up and munch on. Fruit leathers are a perfect way to preserve fruits. You can use them in making juices by simply blending them with water and ice! Preheat your oven to 250F. Line a large baking sheet with baking paper and set aside. Place your fruit and honey in the blender and blend until smooth. Pour the blended fruit over the lined baking sheets and spread into a thin even rectangular/square layer. Place in the oven and leave to bake for 2-3 hours. Check often after 2 hours had passed. Once the top layer is dry and not wet or sticky, that is your queue that it is ready. Remove from the oven and leave to cool for 3 hours or overnight. Cut into strips and roll for the children’s school lunch boxes or your candy jars. Otherwise, You can roll them whole for storage if you like. Make sure that you roll them with the parchment paper to avoid the layers from sticking together. Then wrap them tightly with plastic wrap and place them in an airtight container. These leathers would last for 4 weeks if stored in a cool, dry and dark place. The Palestinian city where my family comes from, Hebron, are famous for making grapes malban. While Malban everywhere else refers to Raha (the Arabic equivalent of the Turkish Delights), in Hebron it refers to sheets of sun dried fruits, mainly grapes, as the city is famous for its beautiful grapes. The Hebron Malban, mainly follows the same principle as in the recipe here, however, the traditional recipe sees the use of much sugar mixed with the grape juice, where both are cooked together to concentrate and reduce, in which case the sugar also aids in thickening the mixture. Some recipes also include the use of starch. The mixture is then spread over large cotton cloths and left to dry in the sun for weeks. The result is a fruit leather without a shadow of a doubt. Very similar to Qamaruddin (the apricot fruit leather famous for making juice in Ramadan).